Standard - €19.99 Only 3 left! Get the fiesta started with this Adult Brown Mariachi Sombrero! Whether you're celebrating Halloween or Dia de Los Muertos, this Sombrero will be perfect for completing your Latin-American costume! 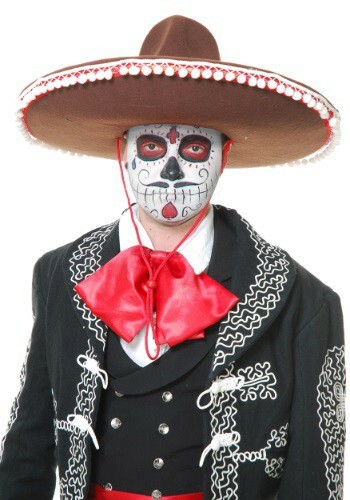 Hoping to dress up in a modern Mariachi costume or an old school 13th century Mexico native outfit? Well, then you'll need this 'shadower' (the literal translation of sombrero!) on your head. It's beautiful red and white trim will grab everyone's attention. Don't worry about having someone like it a bit too much and losing it in the middle of the festive chaos. With a red neck string attached to the hat, you can make sure it stays securely on your head or even let it loosely hang down on your back. Either way, this awesome sombrero will always stay close by and make sure you look magnifico! So complete your Day of the Dead costume with this Brown Mariachi Sombrero and be la viva de la fiesta!